Now Offering 12 Months, 0% Interest Financing on All New Purchases! Atlantic Spas & Billiards is proud to offer our customers quick and convenient financing options that allow you to pay off your purchases over time, including our 12-month, 0% interest financing plan for most purchases, and our 36-month, 0% interest financing for hot tub purchases over $5,000. Now you can have the spa, sauna or game room of your dreams, all without breaking your monthly budget. All applicants are subject to credit approval. For more information, visit one of our North Carolina showrooms, contact us online or give us a call at our Raleigh headquarters at (919) 783-7447. 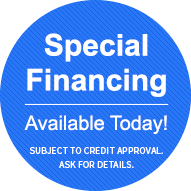 Contact us for financing application information.